The abdomen extends from the thorax at the thoracic diaphragm to the pelvis (the pelvic brim). It is referred to as the abdominal cavity. It is bounded by the vertebrae, the abdominal muscles, the diaphragm and the pelvic floor. The abdominal cavity is a closed anatomical space. 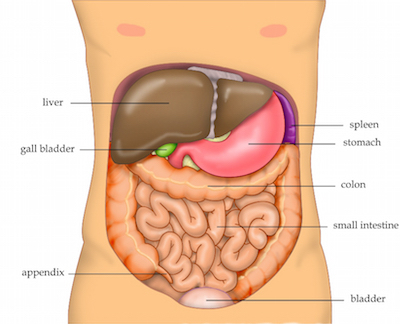 Contained within the abdominal cavity are the spleen, liver, kidneys, stomach, small intestines, large intestines, pancreas, aorta, gallbladder, diaphragm, the lower portion of the esophagus and the inferior vena cava. Failure to diagnose Intra-Abdominal Hypertension leading to Abdominal Compartment Syndrome, multi-system organ failure and patient death following surgery of the Abdominal Cavity may constitute medical malpractice. For a discussion of Medical Malpractice Relating to Failure to Diagnose Compartment Syndrome of the Lower Leg Click Here. Ivatury RR, Cheatham ML, Malbrain MLNG, Surgue, M, editors, Abdominal Compartment Syndrome. Georgetown: Landes Biosciences; 2006. If you or a family member developed Abdominal Compartment Syndrome which was not timely diagnosed please contact our New York Medical Malpractice Lawyers to discuss your case.